Here's what you need to know about these anti-aging powerhouses. Nowadays, you can see a variety of skin care products at the drugstore or department store making all sorts of anti-aging claims. As you peruse the aisles, you may find you’re more confused than ever about what to put on your skin. Do any of these products work? With concerns like wrinkles, sun damage, and dry or dull skin, which ingredients should you choose? While no product will stop the hands of time, some may actually help slow it down. Here, we’ll examine some of the most powerful, anti-aging ingredients to see how they can help you maintain a more youthful complexion. Hyaluronic acid (HA) is a naturally-occurring substance, and it’s found in numerous tissues in the body. High concentrations of it are located in the skin, where it helps the skin retain moisture, flexibility, and elasticity. Many skin care specialists tout its anti-aging benefits. But does it stand up to the hype? As skin ages, it’s likely to become drier due to factors like diminishing hormone levels and environmental elements like UV exposure. In 2014, one study demonstrated that women who used HA for up to eight weeks showed skin that was substantially more hydrated than skin that hadn’t received any treatment. Additionally, the skin was smoother after just two weeks of use. If your face feels parched and is struggling to hold onto moisture, a serum or cream containing HA might be right for you. Everyday elements like pollution, the sun, and stress can damage your skin and create free radicals. Free radicals speed up the aging process, and this is where vitamin C comes in handy. Vitamin C is a potent antioxidant, which defends your skin against cellular damage. Research from 2013 notes vitamin C can be used topically in dermatology to treat signs of premature aging from sun exposure and hyperpigmentation of the skin. However, not all vitamin C is created equal. A 2007 study reports that although many skin care products contain vitamin C, “very few are actually effective in topical application. First because there is only a low concentration, second because the stability is compromised as soon as the product is opened and exposed to air and light, and third because the form of the molecule (an ester or a mixture of isomers) is not absorbed or metabolized effectively by the skin.” Also, vitamin C may have a synergistic effect on the skin when combined with other antioxidants like vitamin E. So, how do you know what type of vitamin C you should use? Currently, more research is being directed toward identifying the best delivery methods of vitamin C on the skin. If you’re interested in using it, a trip to the dermatologist may be in order to choose the formulation, concentration, and products that will work best for your skin type. Retinol is vitamin A, and it comes in prescription and non-prescription formulations. Some products will say they contain “retinoids,” which are substances related to vitamin A. One study noted that “Retinoids are very well known to influence a variety of cellular processes, such as cellular growth and differentiation, cell surface alterations, and immune modulation.” Moreover, research has shown retinol is effective at reducing sun damage, wrinkles, trigger the skin’s production of collagen, increase the skin’s natural hyaluronic acid, maintain moisture, and diminish the appearance of fine lines, and create smoother skin. Because retinol can break down when it's exposed to light, many dermatologists will recommend you use it at night. If you’re thinking of trying it, you may want to start with a lower concentration and work up to a stronger product. But over time, retinol can help improve the quality and youthfulness of your skin. Hydroxy acids (alpha, beta, and poly) are used to exfoliate the upper layer of skin by removing the dry, dead skin. Plus, they stimulate the growth of new skin. Alpha hydroxy acids, in particular, can be used to lessen extremely dry skin, treat the darkening of patches of skin known as melasma, decrease acne, and minimize acne scars. In a 2010 study, scientists report products with low concentrations (those with less than 10 percent) of hydroxy acids are generally safe for most people. In contrast, products where formulations are high (greater than 20 percent), are considered “chemical peels,” and used for severe cases of sun damage, acne, psoriasis, calluses, and other skin conditions. If you plan to use a product with a concentration of more than 10 percent, you should do so under the supervision of a skin care professional. Hydroxy acids can irritate to the skin, including redness, itching, and swelling. 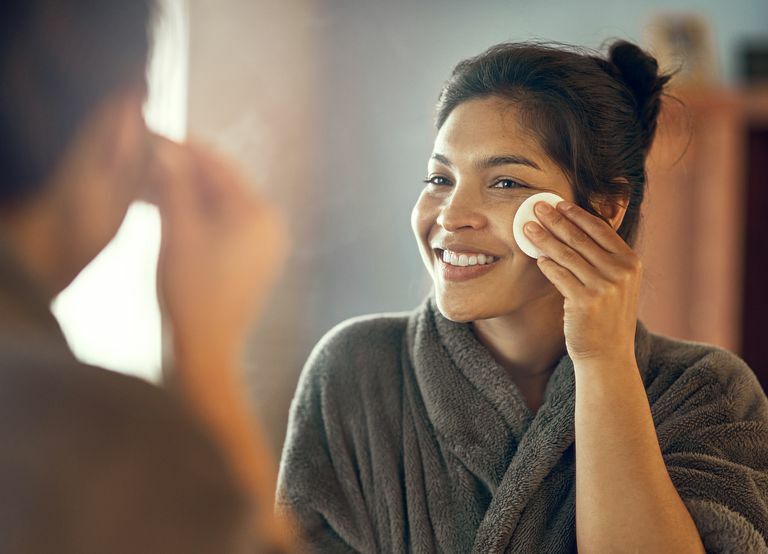 If you still feel like you need some extra help sorting through the sea of products on the market, consult with a dermatologist—they’ll be able to customize a skin care regimen that’s unique to your face and meets your needs. Burke KE. Interaction of vitamins C and E as better cosmeceuticals. Dermatology and Therapy. 2007 Sep-Oct;20(5):314-21. Jegasothy SM, Zabolotniaia V, Bielfeldt S. Efficacy of a New Topical Nano-hyaluronic Acid in Humans. The Journal of Clinical and Aesthetic Dermatology. 2014 Mar; 7(3): 27–29. Mukherjee S, Date A, Patravale V, Korting HC, Roeder A, Weindl G. Retinoids in the treatment of skin aging: an overview of clinical efficacy and safety. Clinical Interventions in Aging. 2006 Dec; 1(4): 327–348.